A Dodge SRT Demon has been captured on video being sent straight back to hell in the most unfortunate way possible. 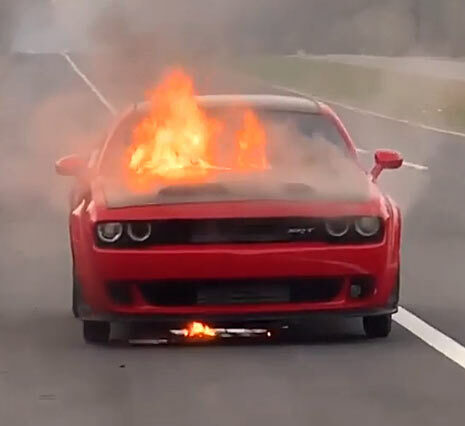 Images and videos have been circulating from a scene of a Dodge Demon on fire, which apparently was caused by a transmission exploding. The car also still has its drag optimised front tires fitted, not really built for public roads, but clearly, this is the least of its problems. An Instagram user @gtfivehunnit posted the video below of the tragic scene with follow up pictures of how much damage was caused in the aftermath. Apparently nobody was injured in the car fire, with some online reports saying that the car was going at 170 before the fire started and that the car itself was modified in some way. The fire also looks like it caused the most damage on the passenger side of the car engine, spreading to the cabin and rear of the vehicle. These points cannot be substantiated, so the only factual point we have now is that there is one less Dodge Demon in the world. Negatives will inevitably arise for such a high-powered vehicle, especially one that comes from a pedigree of straight-line speed on the drag strip, which is also road legal. But the 840 hp Dodge Challenger SRT Demon comes with a acknowledgement document which owners must sign, outlining how the Demon is a vehicle intended for drag racing and the owner must understand its unique qualities. Copies of this document you can find here. With only 3,300 Demons produced in the world, 3,000 that went to the US and 300 to Canada, it’s indeed a rare beast to start with. So, we hope the rest of them stay intact forevermore and the cause of the fire found on this one. Debate will obviously arise because of this incident, but in many ways it’s no different than ferrari’s catching fire. It doesn’t mean the brand or the concept of the car is bad, it means the specific problem needs to be found and fixed, only. Poor @dodgeofficial Demon burning to the ground due to a transmission failure causing it to catch fire, and burn to the ground. Thanks to the officer on the scene for the photos. ? ?